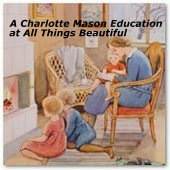 All Things Beautiful: More Reading Lessons on "Twinkle, Twinkle Little Star"
More Reading Lessons on "Twinkle, Twinkle Little Star"
Like a diamond in the sky,"
should be gone through in the same way. As spelling is simply the art of seeing, seeing the letters in a word as we see the features of a face––say to the child, 'Can you spell sky? '––or any of the shorter words. He is put on his mettle, and if he fails this time, be sure he will be able to spell the word when you ask him next; but do not let him learn to spell or even say the letters aloud with the word before him. After he spelled "sky," he then went on to spell other words with similar patterns, such as "fly." As for understanding what they read, the children will be full of bright, intelligent remarks and questions, and will take this part of the lesson into their own hands; indeed, the teacher will have to be on her guard not to let them carry her away from the subject."